Marketers and business owners can be so focused on making the sale that they can overlook a very concerning problem – post purchase cognitive dissonance. This can result in an unhappy customer who will be unlikely to buy from you again and may share his or her resentment with you to all of their friends and colleagues. And that’s not good for business. So what exactly is Cognitive Dissonance? It’s the mental discomfort experienced by a person who holds two or more contradictory beliefs or ideas at the same time. When we experience the feelings of dissonance, we attempt to reduce this unpleasant feeling by avoiding situations and information which are likely to increase it. Essentially we crave for consistency. Cognitive dissonance theory is founded on the assumption that individuals seek consistency between their expectations and their reality. Because of this, people engage in a process called dissonance reduction to bring their cognitions and actions in line with one another. This creation of uniformity allows for a lessening of psychological tension and distress. A classic example of how we attempt to reduce cognitive dissonance is “The Fox and the Grapes” fable by Aesop (ca. 620–564 BC). In the story, a fox sees some high-hanging grapes and wishes to eat them. When the fox is unable to think of a way to reach them, he decides that the grapes are not worth eating, as they are probably not ripe or that they are sour – hence the common phrase “sour grapes”. Unfortunately there are times when our customers experience dissonance when buying our product or service. The decision involved in the purchase must be important, such as involvement of a lot of money or psychological cost and be personally relevant to the consumer. The buyer must also have the freedom in selecting among the other choices, and the decision to buy, once made is irreversible. Marketers can help reduce cognitive dissonance by engaging with their customers and influence their feelings about their purchase and future purchases. And video is a highly effective tool to help you achieve this. Create after-sales videos to share with your customers. These include personal videos from you eliciting your customer’s feedback and comments. This will give you the opportunity to respond to any negativity, which if left unattended, could grow and come back to bite you. 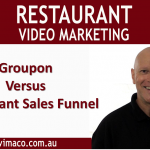 Videos can also show other uses for your products or services and hence give them greater value to your customer. Videos can also show how to perform proper maintenance and repairs and reduce problems in the future. Encourage “User Generated Videos” by asking your customers to upload videos of them using your products. There is nothing more powerful or compelling than seeing customers using and endorsing a brand. How the customer feels about a purchase will significantly influence whether they will continue buying from you in the future. Overcome Post-Purchase Rationalization by delivering video content that reinforces the buyer’s decision. Encourage public support for your brand through comments, testimonials and User Generated Video and that will not only help to make a happy customer, but a happy business owner as well.